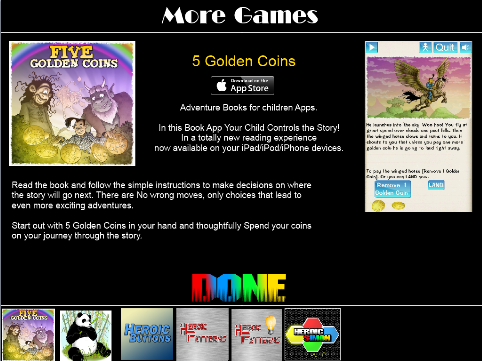 I finished coding the new 'More Games' page in the Heroic Simon App tonight and figured I'd take it for a spin on my iPad. I also wanted to check out the latest fix for Landscape splash screen by Marmalade. It always seems to break every SDK update haha! Anyway I built it easy enough and then used testflightapp.com to upload the game nad it should have been good. Only while I am installing it on the iPad it tells me that it cannot install right now, wanna retry, or try again later. Like something is magically gonna fix this for me, bah! Posted by VoodooChief at 12:44 AM 0 comments Never simple Eh! 3 Games at once in Apple Review, Wow! I am busy at the moment with home improvement projects and work and family and also fixing a bug in Heroic Patterns. The Lite version does not have this bug, but the paid version has a bug. Well in fact it has two bugs. One is the setup of the shared leaderboards, which somehow were not setup correctly for the game. So people buying this version cannot see their high scores and achievements, grrrr. The second bug is that the bonus pattern which is supposed to appear once per day is permanently on, which gives the paid player a huge advantage in the leaderboards. Along with all that I am working on getting Heroic Simon done and out the door, or at least to Apple test. I am truly close now with all my submission graphics and information done. All I Have to do as I type this is make a test version of the paid and Lite games and upload them to my iPad. Once tested I can then build a version to send to Apple test. It could be quite a time having 3 games in Apple test at the same time! Oh, I haven't mentioned that my daughter who I am teaching to drive is doing wonderfully and it makes me so proud as I teach her. I believe this is a fantastic bonding experience, and I am sure many parents have felt just as full of pride as I do at this moment. Then along with this I have my son who besides growing ridiculously tall for his age is maturing in a way that makes me so proud. To see him in his boy scout uniform and hear him talk of the focus and effort his has for it is awesome. Now I know I don't talk about my family usually in my posts, but this weekend has had a lot of my kids in it and I could not be more proud. Posted by VoodooChief at 10:15 PM 0 comments 3 Games at once in Apple Review, Wow! As I am getting close to getting Heroic Simon for the iOS done and out the door, I realized it was time to do something I am not great at, something I do not fancy doing ever.. The games description or copy. Within each games submission directory I have a text file that I place all the important submission details into. That way it goes into my revision control system and I never lose it. This text file contains such important information as the key words, and the category the game is going to be published under. It also contains the copy for the game. Well I steeled myself tonight to start on the copy, come up with some ideas and put them down. Then I can let the ideas percolate for a few days while I struggle to make them make sense when I write them down. Only I was shocked too see, the copy is already done, and it isn't the worst I have ever written, WOOT! So I have already done this painful task... I am rather pleased about it haha! I am finally getting organized enough to get Heroic Simon out the door. I have had it completed now for several weeks, but been too busy or distracted to get the thing out. Now I am nearly ready. I am not even going to worry this time about a supporting promo video. I have a whole host of ideas, some silly and some smart. I have no idea which to do at this time. Still the problem I blogged about a few days ago is giving me fits. I cannot seem to get my head around the fact that I have crossed the naming streams I so carefully set up.. GAH! To get over this annoying issue I have created a text file that I am copying in all the names and references for each game and that gives me hope I can actually sign these games off the correct way and give them the correct crossed provisioning files. It's not like I want the Lite version to go out as the paid version and vice versa, that would be simply wrong. I have both Heroic Simon and the Lite versions all done and ready for release now. Only I have screwed up something important. 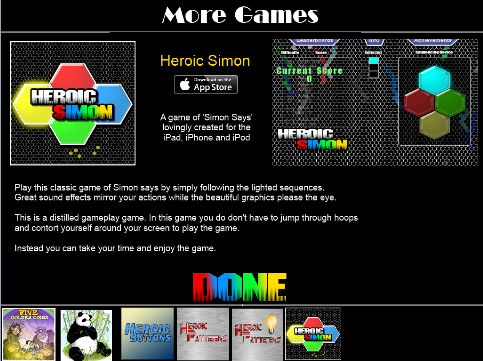 Namely I went to the iTunes connect and created my new App, called it Heroic Simon and attached the game certificate as I am supposed too. Only I attached the Lite certificate to the none Lite name.. So now I have it backwards. This means it will forever be the wrong way around. And if you have ever read much of my blog, you will know how I hate this kind of misnaming or confusion. I hate multiple directories called the same, such as several data ro bin or tools folders all under the same main directory. It is simply ridiculous and confusing. Naming things incorrectly and using them this way is expedient at first, but you will pay with more time later as you sort this stuff out. Now I am going to have to create a new production certificate with a name that will show that it is the REAL Heroic Simon Lite, nad the one using the Lite certificate is in fact the Heroic Simon version.. GAH! I was wondering today what people do for inspiration for their current game, their next game or even to renew their desire to keep on going when to be honest the outlook for success looks bleak. Myself I use all sorts of external inputs. Be them music or movies or most anything. Cos that is the secret for me.. Pretty much anything I see or o seems to give me inspiration for my next game. Top of the list is probably when I do manual labour. Not quite sure why but somehow getting a sweat on seems to open up my mind, both during and after the work. Well I know this is a short post, but I just got through creating an area in my garden for my trailer to park, so I have done digging nad leveling and form creation and concreting. then I got to level more and this morning lay a bunch of gravel... 2400 pounds of gravel from the bed of my truck. It was tiring hard work, but so fulfilling. So to that end... I have created TWO looks of the page. There is two looks as some games are Landscape and some Portrait. So I have set this up for my games to show BIG and WELL. There is my portrait page. The idea is the same for both of them, but the areas I have laid out for them differ slightly. The bottom area will most likely evenly space out the game icons, and I will have some sort of highlighting for the game on display, then after 3 seconds or so I will fade the current game info out and replace it with the next game in the sequence. With those 5 sets of Data I can set this page up for multiple game pretty easily. I can also then copy the code ad the associated artwork over to any new games, or maybe retrofit it into previous games and update them. I know that mantra.. Do one thing, then another and before you know it you have all your work done. Only I sometimes forget this, or get confused or just pick the wrong 'one thing'. In my current situation I am struggling with one thing I know I am not good at. I know this because I spend an inordinately large amount of time working on this and when I am done I never quite feel satisfied, though some times I do surprise myself. I am talking about layout of informational screens. In this case I am busy trying to add a 'More Games' page to my Heroic Simon game and failing because I cannot get a good layout for the Icon and text for multiple games. Such a simple thing.. I have ex workmates who were fantastic at this kind of thing, pity their excellence never rubbed off on me. On another note.. Last night I renewed my subscription to apple and I am surprised to say that it didn't appear to affect my development in any way, except costing me 100 bucks of course. Maybe I am getting mixed up with my certificate refresh date in November, sure seems like it. This didn't go well last time. If I remember rightly I answered some box that appeared in a confused manner and it broke my whole setup. thankfully it was a year ago and my memory cannot recall exactly what went wrong. This could be a bad thing or a good thing depending on ya point of view. Still it has to be done... I am nervous as to what I will break... Still. I already have Heroic Simon ready to go, though I decided today to create a proper 'More Games' page, and not use the hacked in functionality I currently have. After all I should be cross promoting ALL my iOS games. I also have a friend in England who has just released a really nice game for iOS called Racer8 (go check it out!). I will most likely cross promote that as well. why not, what does either of us have to lose? Still available as I type this Blog post. C'mon, don't miss out on something that is FREE, and this license is good for a Whole Year! To Celebrate them going to GDC they have opened up the opportunity to get a FREE community license for a whole year! Go to that link, the promo code you want is available in their Blog but it is GDCFREE. So once you have logged in and typed in that code, simply click that big Promo button near the bottom. Then hey presto a new 1 year community license, OR an extension of 1 year! Go on, do it, even if you think you might not use this soon, or ever. It cannot hurt you to be prepared eh! As my last post about programs I use in my development of games was met with such interest, I figured it was time to make a second installment. Here are 4 more invaluable programs. Development was never so easy as it is now. 1. Paint.net. This is my default/go to art program, it does so much and it is Free. It also has a large amount of addons people have written for it that allow it expand it's range of features. Wonderful, even if I am not great with it. Fast, small and a bunch of regular Photoshop features makes this one invaluable. I used to use Gimp before this, but I never liked the program and found using it to be unintuitive and awkward. 2. Notepad++. This is another invaluable asset to any programmer, and once again it is free. I use this most excellent test editor for XML files, for LOG files and pretty much anything that has text in it. It is very customizable as well. A must have asset. 3. Fraps. I love Fraps, for a very small program this pack s a good punch. Allowing me to take screenshots of my games or video in resolution. Like I said it is compact and yet produces a lovely video for me to work from. Also very cheap to upgrade, and the upgrade gets rid of a small watermark on the screenshots or video. 4. Dropbox. Everyone probably already knows what dropbox is and what it does, but for those not in the know. It is a small addition to your system and comes up as directory. You can place data or code or whatever in your dropbox on say your PC and it will appear in your other dropboxes, on your Mac, or you Tablets or Phones etc. This is especially valuable to me when working on a laptop and then moving to my desktop occasionally. Though it's real value is working with a team all over the world. You can invite people and give them access to your sub directories. That enables you to place a piece of artwork in dropbox in Spain and then i'll get it shortly later in America. Brilliant. I also use it to download to my daughters Samsung phone, and to get my game files I build on my PC to the Mac. You know I have just completed creating my 3rd distilled gameplay game, Heroic Simon. These have all been created for the iOS devices. The reason for this is that I didn't want to have to create my own leaderboard display routines and graphics. Whereas the iOS stuff comes with Gamecenter graphics and displaying built in. It appears that I am wrong about the Android Play SDK. Check out this little gem I found while re-researching this issue. Woah! Did I just find that they have a default way of displaying the leaderboards for Android. I think it looks like it. I believe I will be doing some more Android development pretty soon. Though I was waiting to see if one of my distilled games worked out first, just to give me real incentive to get it converted. Hmm, write the next game or work on converting to Android... Tough decision I reckon. It's true, I like going to www.GameTrailers.com and watching videos. I also like one other aspect of going there as well. Once that I am not sure other people appreciate or enjoy as much as me. Namely... comments.. Yep, the comments sections on trailers and reviews can be freakin hilarious. The people that comment a lot on GT tend towards being nasty and derogatory about the videos. At first this was a bit disconcerting, but then I adjusted the way I felt about these people. Now some bring up excellent points, and some bring them up in some horrible ways. Still it is great. My favorite are the entitled peoples comments. Now I have to add here that the first time I really went to GT was when I had some trailers I created for my Xbox360 games. I got slammed, and that is where I started to learn just how cool the comments from people were. Some are truly funny AND about my stuff. Brilliant. Everyone knows they cannot please all the people all the time, Heck, it is simply ot possible to please any large group of people any time. Ok, I am done, but realize I have placed my Heroic Patterns Promo video onto www.GameTrailers.com. I will add the link to it once it is approved. Go on, check out a video trailer of a game you like, then go enjoy the comments section, I dare ya! Free Marmalade Licenses available NOW! Posted by VoodooChief at 10:19 PM 0 comments Free Marmalade Licenses available NOW! Realease a Game on April 1st? There I was last night working on my Homepage and adding a page for Heroic Patterns when I realized I really didn't want to release Heroic Patterns tomorrow.. erm.. today. On April 1st. The two main reasons I have is that people might think my game is a joke (some people might anyways! ), also I expect people to be too busy downloading real joke apps and stuff to bother with my game. So I have delayed the launch till 3rd April. I sure hope you can all hold out till then! Still, the web page is done, the setup of the release date is done for both the full and Lite versions in Apples iTunesConnect. So now I need to get ready for marketing, which in this case consists of very little as usual. Laters everybody, have a happy Aprils Fools day! Posted by VoodooChief at 7:39 AM 0 comments Realease a Game on April 1st?